While the above is definitely in my top-five for favorite meals (there's something so wonderful about simple, fresh food), my current obsession is dipping pretzels into Nutella. It's the perfect combo of sweet and salty. YUM! Steamed butternut squash mashed up with basmati rice. Something about the two makes for a wonderful taste. Love the tomatoes up there by the way. Mmmn. I've been chopping up similar market tomatoes into chunks and tossing them in a bowl with a dash of balsamic, good olive oil, ripped fresh basil and salt and pepper. Then I leave to mingle while I cook a few swirls of tagliatelle. When the pasta is cooked, drain it and then toss the tomatoes into the pan. Warm up - not cook - and then tip into a bowl and top with freshly grated parmesan. Yum. Also now obsessed with porridge, thanks to a great article by a friend. First I tried stirring in a yummy market apple (grated) with cinnamon and brown sugar on top. Now I'm stirring in a touch of cinnamon and ginger with a bit of vanilla paste and some quality raisins (before it cooks) and topping with warmed up red plums that have been roasted with some orange juice, honey and chopped stem ginger. Also yum. I LOVE that photo of the tomatoes at the top. The colours are stunning! Current food obsessions would be delicata squash (sweet potato squash) - you don't even have to peel it! Delicious. I also have a never-ending love for kale. I am currently obsessed with black mission figs and acorn squash. Obsessions: Fresno chili jam (on top of anything, but especially cream cheese and crackers) and sliced plums topped with honey whipped cream. tomato with sea salt, avocado with sea salt, toast and butter with sea salt, chocolate on bread with sea salt,... see a trend there? Beautiful picture! Current food obsession: honey crisp apples and kettle cooked baked chips. My current food obsession is the 4-Hour-Body diet. Which means eating a lot of beans. A LOT of beans. But also binging on whatever I want one day a week. It is likely completely unhealthy. P.S. Those tomatoes are just beautiful. I totally fell in love with heirloom tomatoes this summer! Gorgeous! Have a wonderful weekend:-) I'm loving pumpkin in everything... I am going to turn orange. LOL. does that happen with pumpkins, too? I've only ever heard of it happening with carrots! Ah! LOVE the tomatoes photo! 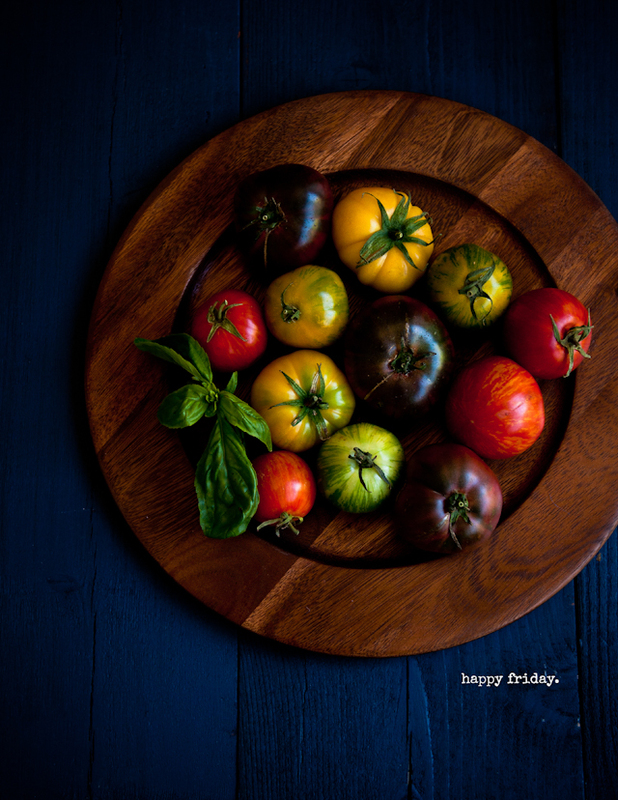 I hope there are still some tomatoes left at the farmers market this week; I'm not ready for them to be out of season! My current food obsession is vanilla ice cream sprinkled with Guittard cocoa powder. So good! recently I have had a really strange obsession with grilled cheese sandwiches with tomato, avocado & hot sauce. Pickles, salt & vinegar chips have been a problematic addiction:) Heirloom tomatoes and mozz will always be a regular dish in the house. Other then that loads of veggies and pasta. I'm a pasta freak!!! any kind and in any amounts... especially, tagliatelle with peppered beef and double cream, topped with my favourite parmiggiano!!! Or penne with home made red pesto and cashew nuts!!! Love the pic. So beautiful. My current food obsession: cookies. And wine. Is wine a food? It's spring in Australia and they're just coming out now! I've been eating so many my mouth is stained purple. I baked a 'berry' special cake out of them :) *excuse the pun. We had an over abundance of tomatoes in our garden this year so although I adore a simple caprese, I'm all tomatoes out. Now I've moved onto Butternut squash and kale. I'm sure in a few months I'll wishing I had even 1 garden fresh tomato. Stunning photo! I wish our farmers' markets offered such beautiful varieties of tomatoes. My current obsessions include sweet potato hummus (well, sweet potato anything) and pumpkin bread!